Hand 200 Billion is almost here! You've played billions, and billions (and billions) of hands at our tables, and from April 15, it's time to say thank you. Open your lobby, register for your favourite games, and get ready. 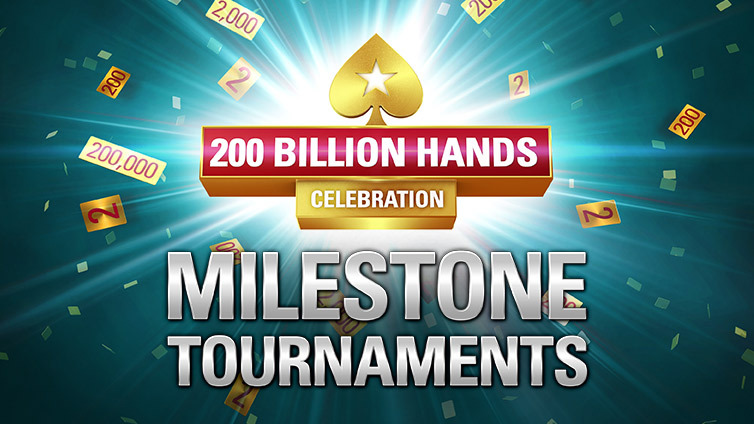 The 200 Billionth Hand is coming - make it one you'll never forget with 200 Billion Hands Celebration offers and free giveaways! Get dealt into hand number 200 Billion and you'll net $10,000 instantly. It doesn't matter if you're playing a tournament or a cash game. It doesn't matter if you fold preflop or river quads; anyone dealt into the 200 Billionth Hand will win $10,000 – win, lose or fold. But $10,000 isn't the only prize you can win. Read on for more offers coming your way from April 15. Play cash games during selected hours for the chance to win Chests stuffed with rewards. No opt-in required. Just take a seat, win a hand, and you could win a Chest! Enjoy random tournament ticket drops and play some of our biggest events for free. Just register for select tournaments for a chance to win. Log in and play a single hand of poker to get a new reward, every day. Win up to $2,000 each time. Grab a slice of $10,000 in the 200 Billion Mega Freeroll! Play a hand at any real money table before May 1 for your chance to qualify. 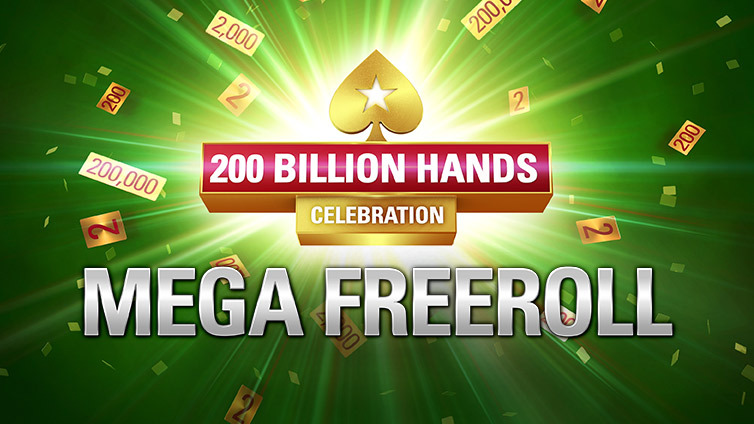 This Promotion will be announced and will begin at 10:00 ET on April 15 and ends at 23:59 ET on May 1, 2019 (“Promotion Period”), with the exception of the 200 Billion Hands Celebration Freerolls, which will end at 21:00 ET on May 2, 2019. Throughout the Promotion Period, we will offer random reward prizes from our 200 Billion Celebration Chests (“200 BCC”), which will be displayed on the 200 BCC window in the Client. have a chance to win tournament tickets in selected daily Milestone Tournaments specified under ‘Participating Tournaments’ here. In the event that the 200 Billionth hand is dealt on one of our play money tables, the players dealt into the first eligible hand on a real money table after the 200 Billionth hand has been played (subject to Clause 1.3(c) above), will each win a cash prize of $10,000. You will only be eligible to receive prizes from the Cash Game Surprise if, during the specified times advertised, you win a hand during a real money cash game. Your ticket to the ‘Mega Freeroll’ will be locked in a chest until May 1, and you will need to login on May 1 before 14:00 ET to open your chest and register to the ‘Mega Freeroll’ manually. All rewards that form part of this Promotion will be credited instantly after opening the 200 BCC and will be yours to keep, with no restrictions or earning requirements. 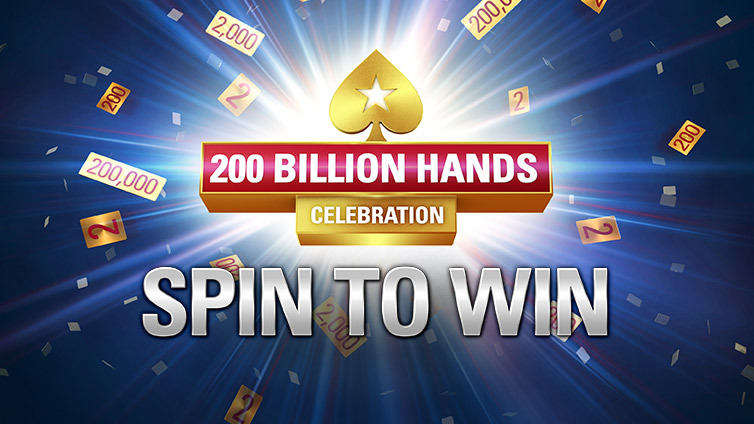 All players who are dealt into the 200 Billionth Hand will win a cash reward of $10,000. 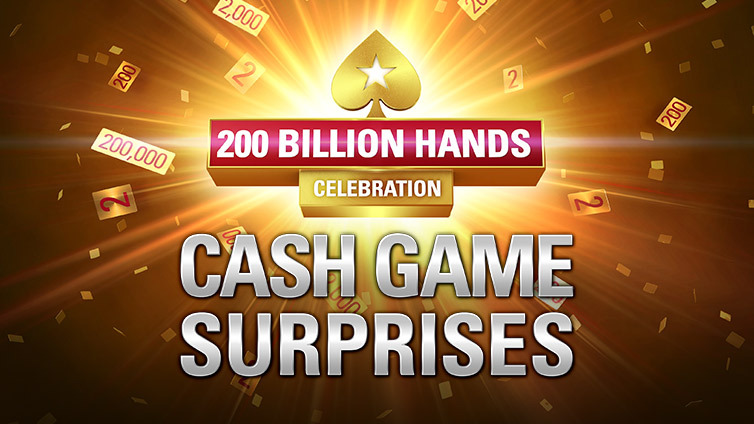 All cash rewards from the 200 Billionth Hand will be credited within 24 hours after the hand has been played. All tournament tickets won from our Milestone Tournaments will be valid for 30 days after they have been issued. Any unused freeroll tickets won and/or received from either the 200 BCW or the Mega Freeroll will be forfeited at the end of the Promotion Period. Tickets won during the Promotion cannot be exchanged for cash. We reserve the right, at any time, to alter these Terms and Conditions or cancel the Promotion altogether where we believe that the Promotion is not capable of being conducted as specified or as a result of any unforeseen circumstances which affect the administration and/or any changes to any Promotion shall be made on the Site. By entering this Promotion, you hereby confirm and agree that you wish to be bound by these Terms & Conditions.